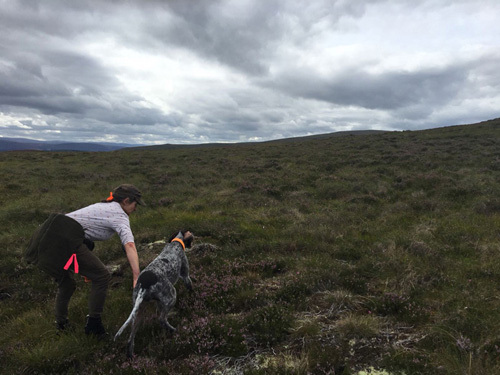 This year’s counting of grouse broods is nearly done in the Scottish Highlands. 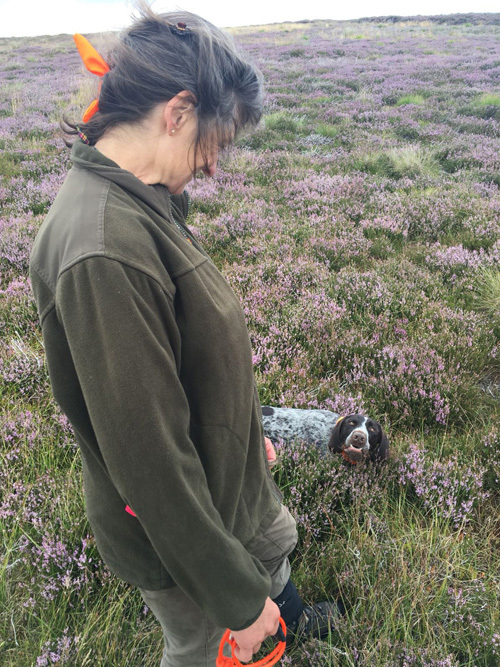 It is a very poor year for breeding, which is such a sad thing to see. We had two years of bad rain in the breeding season and bird stock was down. Then, when we thought that we could surely not have a third bad season, we got drought and the chicks could not find insects or get water with a very high mortality as a result. However, it has still been a nice time, running the pointers and this year I have had mostly Gaia and Pontus out. Sadly, Gollum has got a problem with his nails and one came off completely leaving him on three legs, staying at home. 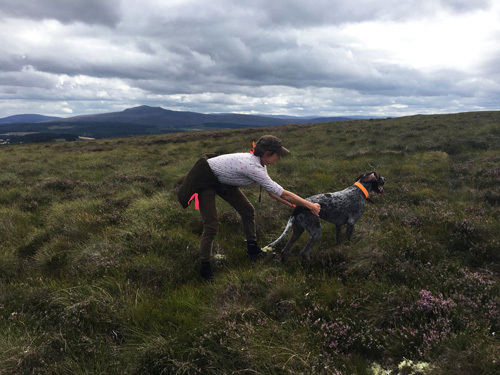 Gaia is a total machine, she runs the moor in a straight line perpendicular to the wind direction and hardly ever fails to point the birds. 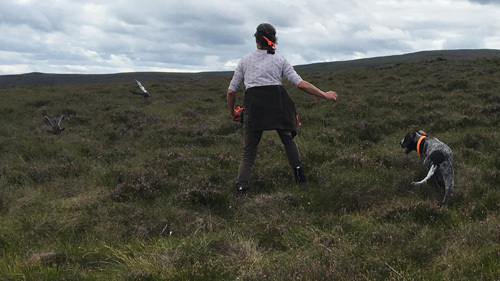 On a back wind she chops the moor in manageable sizes and works the wind back to me, pointing any bids in the way. Just a delight to see. Pontus, however, is now two years and two months and he is still learning. He is a pleasant dog to run as he is very aware of where I am and turns well on his own or on the whistle. 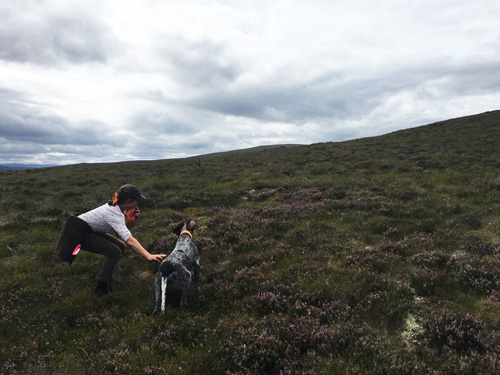 He is not quite so aware of how to work the back wind, but the ability is clearly in him and he often takes a large bite of the moor, working back towards me. He works logically and systematically. He will be great. My biggest issue with Pontus is his handling of the birds and finding out how close he can get to the birds without flushing them. In other words, he creeps. He smells the birds, runs closer, starts stalking, but then he often keeps going till they get up. This is not how he is meant to handle the situation. He should point and get close enough to put a little bit of pressure on the birds without scaring them enough to fly. 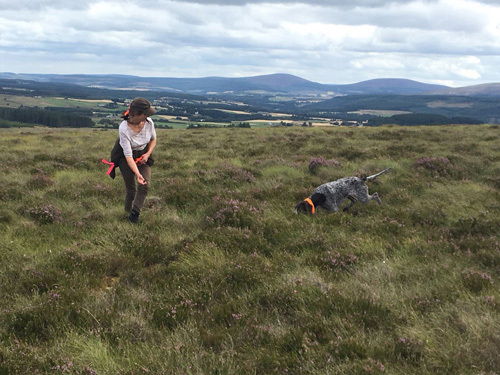 So the way to try and help him is two-fold: 1) getting to him while he is on his creeping point (this involves a lot of running through the heather) and holding him back before he creeps up on the birds. 2) make sure he respects the stop whistle and sits when the birds flush. That way he will be more cautious of flushing because the SIT command happens straight after. I am well prepared for ending up with a “sticky” dog that will not flush when asked to, but to have a pointer that just creeps is worse. Pontus’ mother, Gaia, was a little bit like this and she is now impeccable in her bird handling, so I have faith. So as he hunts the moor I keep an eye on him and I try not to allow him to hunt too far out. Once he takes scent and his body lowers while he trots forward in a straight line, clearly with bird scent in his nose, I start walking and running up to him in order to get to him before he gets too close to the birds. Once I catch up with him, I stop him creeping and even pull him backwards. I stand there with him praising him and stroking him. Every time he puts a foot forward, I pull him back. Once I feel he is steady and still on point I step out beside him (as you would do if you were shooting over the dog) to make him steady on his own. Again, if he puts a paw forward, I pull him back. At times I even have to pull quite hard to get him back as he is rather keen. It looks like a pantomime. Holding Pontus back, almost in a comical way. Eventually, when I feel he has been solidly on point, I allow him to go forward. He is a real creeper and when he is encouraged to GO, he still just creeps, but we can deal with that later. Eventually the birds will get up and I make sure he is steady. The idea is that when the birds flush, the dog should be either sitting or at least stand still so he can watch the birds take off and mark a shot bird if it is on a shooting day. Using the stop whistle to encourage him to sit to the flush. After the birds have left, I make sure I get him to hunt DOWN wind from where they sat in order to check for other birds. Many dogs with experience do this on their own and it is great to encourage it during training. 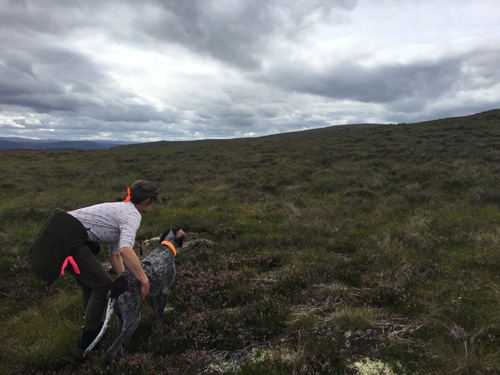 Hunting Pontus downwind from where the birds sat is good practice to make sure they have all gone. He is a funny dog with lots of attention on me. Especially when he is waiting and hoping for the command to hunt. Here he is, staring at me, hoping to be sent off. Pontus forever having eye contact hoping to get the hunt-command. Both dogs work hard and at lunch, they don’t hesitate to grab a snooze in the car. As always, the car is fitted out with a great, bespoke dog bed with a fleecy cover. 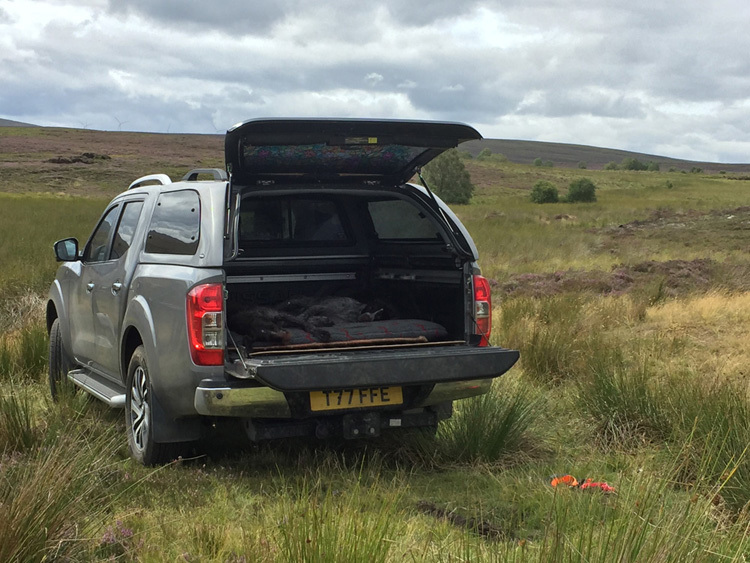 Best place for the dogs is on a bespoke dog bed in the truck. ....and Then the Wheels Fell off. As my dearest friend, Anne Johnson, says: “With pointers, in particular, just when you think things are going beautifully, then one of the wheels come off …….” And that is so true. It has been a while since I .. Many of our customers are following the development of Pontus and I must apologise for the long silence. Pontus is a SLOW developer and it didn't seem as if there was a lot to report during the season, but I have summed ..